When the conversation started with the Towner to discuss a commission for a bench for the foyer for the upcoming touring exhibition Ravilious & Co: The pattern of Friendship, it soon became apparent that one bench would not be sufficient. Enter to the stage my ‘Three Piece Sweet’, or rather, three pieces for this exhibition. The bench will quite literally become part of the furniture at Towner, I am proud to say, a commission for them, whilst the other two chairs will be for sale from me. The exhibition www.townereastbourne.org.uk explores the relationships and working collaborations between Ravilious and his affiliates, Paul Nash, Enid Marx, Tirzah Garwood and Edward Bawden amongst others. 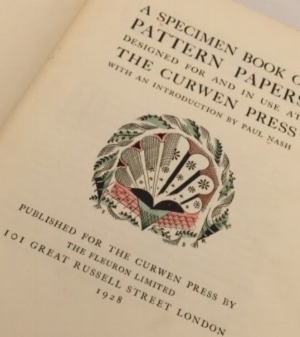 The inspiration for the fabrics began with the beautiful book, ‘A Specimen book of Pattern Papers’; Curwen Press 1928. It has been both exciting and difficult to choose just three designs from the thirty one beautiful pattern papers in this gorgeous book. I am reassured in the knowledge that, under license and contract with the Towner, I will have the privilege of developing exclusive fabrics for future commissions. So the three designs we have selected are; a bold Paul Nash fabric for a lovely Ercol bench I have sourced. Another Paul Nash design for a new chair shape that has some beautiful woodwork. And an Enid Marx Cocktail chair. More on these in the next post, I’m looking forward to seeing them all come together and to see the exhibition as a whole. It opens on May 27th, details in the link above.